The Magical Music Singers includes members grades 9th - 12th, three per vocal part (soprano, alto, tenor, and bass), and can include a few alternates depending upon auditions. We are looking for singers with mature voices who have solo power and character, but can also blend with other voices in four-part harmony. Also, these singers must bring physical and facial energy and animation to their live performances. The "life" one brings to singing a song not only greatly enhances the entertainment value of a live performance, but the actual vocal sound in the recording studio. In addition to the live performances, this group records songs as needed. Rehearsals are held on scheduled Sunday afternoons at The Studio in New Canaan, CT. Because rehearsals will not be held on a weekly basis, memorization is very much left to the responsibility of the individual singers. There is a participation fee for each of these groups to help defray the costs for the director, rehearsal space, sound technician, and other performing expenses. 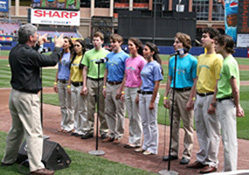 All singers are expected to participate in TUNES IN TIMES SQUARE, our annual May sing-a-thon benefit concert in Times Square, NY, and most of the respective group singing commitments (usually charity events). 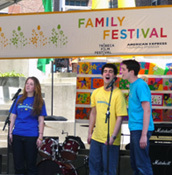 Over the years, the Magical Music Singers have performed at venues including the Tribeca Family Festival, TUNES IN TIMES SQUARE, Citifield, Habitat for Humanity Gala, Palace Theater, NFL Charity Gala, Diabetes Walk New Canaan, One Town ... One Voice Concerts, 9/11 Remembrance events, Holiday Stroll, Staying Put Anniversary, Waveny Care Center, and Child Guidance Gala. Magical Music for Life is a participant in the President's Volunteer Service Award and time spent with the singing group qualifies toward this award. If you would like learn more about the Magical Music Singers and/or our recording projects, please contact the Magical Music office at info@magicalmusic.org. Audition information can be found on the Audition page.